So let me start by saying sorry if the new linking system coursed you any inconvenience, from now on i'll be using the adf.ly short url site as for roughly every 1,000 clicks i get on my links i receive $1, although i dont see myself making much from this as my highest blog view was back in September 2009 when i had 1,600 views i still feel it was worth trying out. For the people that came here from other means and dont know what im talking about.....when you click a adf.ly link to my blog it will take you to an advert page with a 5 second countdown on the top right corner of the screen, once that reaches 0 it will say "skip ad", just click on that and it will bring you here.....if this gets annoying for people please just leave a comment in any of my posts and if enough people find it a hassle i will set it back to normal. Now on to the animations, so i just finished week 2 of my new schedule and i must say its going rather well, i had a few issues the other day and for the last 2 days i've been feeling really ill (hence why its taken me 2 days to post) but other then that its all goes great. I started off this week with a good old bouncing ball excessive as part of the Guardian course and as part of the Slow In & Slow Out class, the task was the have the ball go through 4 different stages starting with a linear up and down motion and ending with a slow in and slow out motion on both the up and down. I started by placing keys at frame 0, 15 and 30 then using the inbetweens that the computer had already put in there i set a key at frame 13 and moved it back to frame 9, this gave me a slow in on the up of the bounce and i repeated this process for the slow out. this offered a smooth movement and it utilized the computers spacing to get the result i was looking for. I use this same technique for the slow in and out for the down as well and the combined the 2 to get the final result of slow in and out on both the up and down. Class 8 was focused on Arcs and how they are present in every organic movement we do so should be studied in great detail. The Task was the have the ball bounce across the screen in a zigzag and then add breakdowns either side of the first up to create an arc in the movement instead of having it look jagged and sharp. 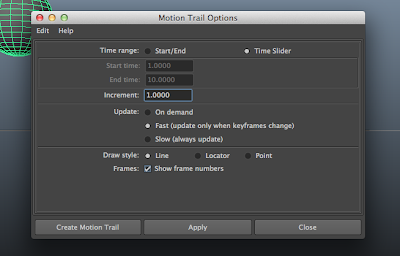 During this class i found a really useful tool in Maya that i hadn't known about previously which was the Motion Trail option in the Animate menu. This tool will plot out the motion of the object that it is linked with, to use it this is what you need to do. 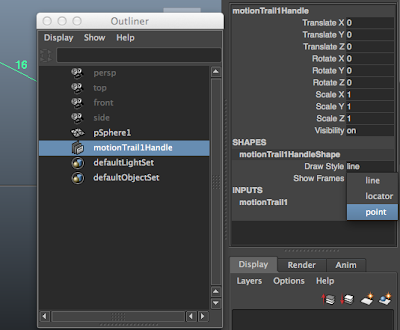 Select the object you which to see the tangency of and in the Animate menu click on Create Motion Trail, if you want to get more options click on the small box next to it and the options window will open. In the options menu you can choose the time rage, the increments of where you want to points to be placed (every 2 frames, every 6 frames, etc) and how it is updated....if you are fine tuning your arcs i would suggest having it on Fast (Update only when keyframes change), there is also the option as to how you would like the points to be displayed, you can choose from a Line which will create a lone between every point and how you exactly where the object will be, Locator which basically shows Nulls where points are and Points which does basically the same thing as Locator but less messy. there is a final option that called Frames which is the frame number, i have this turned on as you can then see what frame number everything is happening without having to look through the timeline. If once the points are plotted you dont like the way it looks, it can be changed very easily in the Outliner....just go into the Outliner and select motionTrailHandle and then in the Channel Box on the right hand side of the screen there will be the option to change some of the setting you had already picked such as the Draw Style (Line, Locator, Point) and if the frame numbers should be displayed. 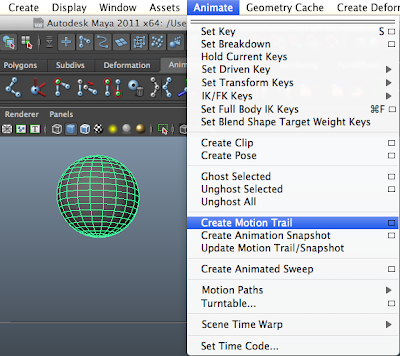 the great thing about this this option in Maya is that its constantly updating (depending on which option you picked in the options menu) so when you move the object it will correct the line to match the changes made. So the last practical class of the week was secondary action, now this lesson was a little confusing to me and im not sure if i fully understood it but i followed the notes as best as i could and i hope that it goes into more detail on the subject in later lessons so i can get a better grasp on it. The task was to create a bouncing ball (similar to the one in the last lesson) but this time having it follow a sinewave on the upwards motion and give it a slight looping action on the down, as i say i wasn't to sure what this meant....i looked at what i did back in 2009 and reading it again its totally different to what i did back then (meaning is did it really wrong last time round), but heres what i finally ended up with. So thats it for this week really in the way of practicals.....the other lessons where more of study reference videos and images, a fun class was Timing....i had to time a load of different movements and work out how many frames it would take to do each movement. As an example, for me to walk from one side of the room to the other it takes me 4 seconds at a normal pace and i use a total of 8 steps which means that the scene would be 96 frames long (at 24 frames a second) and each step would take 12 frames meaning each step would be half a second. this was a really fun excessive and for th rest of the day i was timing every little action i did to fine out how long things would take, its something will be doing a lot more as well until i feel i have a better grasp of timing as i know in the past my timing on my animations haven't been the best but hopefully which these exercises that will improve. So all in all its been a pretty good week, sadly though my script still hasn't been given me any tasks i think it was a little to high of a random number range so i have taken the max down to 3 so now if its 1 it will give me a drawing task, if its 2 it will give me an animation task and if its 3 it will give me nothing....hopefully this will work better. if nothing comes up by Thursday though i think im going to just set it to max 2 and have it run every 3 days so that i will defiantly get a task every 3 days. 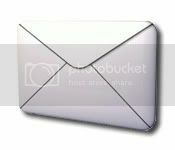 Anyone else who is using my script.....are you finding that its not coming up with a task for you at all or is it working well for you? did you change the number range on the script to get better result, if you did what numbers are you using? i would love to know. Now in my travels around YouTUBE again i came across the Lynda.com tutorials for Character Animation on there podcast channel, they are just taster videos of the course that they offer (Character Animation Fundamentals with Maya), since the videos where a little scattered around the site i took all the ones that where available on there channel and made a playlist out of them for your guys to watch so i hope you enjoy. Well thats it for this week guys, talk to you all in a weeks time and dont forget to comment about the advert links if you find them troublesome at all.